Road Less Travelled: Abode of Stunning Waterfalls & Caves- Cherrapunji! Abode of Stunning Waterfalls & Caves- Cherrapunji! The last leg of our 50 day backpacking trip across Nagaland, Manipur and Meghalaya took us through some of the extremely beautiful rural villages of India and what better way for a grand finale than a stop over at Cherrapunji. A place that held the title of "The Wettest Place On Earth" for years is now in competition with Mawsynram for the title. A friendly tug of war for the title 'wettest place' is for sometime going on between Cherrapunji and Mawsynram. Meghalaya is famous for a number of scenic waterfalls, natural living root bridges, caves and some brilliant landscapes. This journey around Cherrapunji on beautiful mountain roads with stunning green scenic valleys, monoliths and very few homes on the way makes you feel like you are in a different country. Cherrapunji aka Sohra has some incredible attractions and can be done as a day trip. But apart from these attractions Meghalaya is famous for Living Root Bridges, the only one of its kind in the whole World with the most famous and challenging to reach is the 'Double Decker Root Bridge.' This incredible man made Natural wonder is in Nongriat Village, 20 km from Cherrapunji, and can be reached by trekking over 3500 steps. The trek takes anywhere between 2 - 2.5 hours down and 3- 4 hours to climb up. It would require an overnight stay at Tyrna village as it is not feasible to do a day trip from Shillong. Cherrapunji is also home to the incredible Nohkalikai Falls, the tallest plunge waterfall in India. It was a mesmerizing sight to watch water cascade down the hills over a height of 1100 feet and plunge into a deep blue natural pool formed at the base of the falls. Even when she is not at her full throttle, it is still captivating and makes you fall in love with Nature. Standing in the viewing gallery we promised ourselves we would be back during monsoon to experience her splendor. Nohkalikai in Khasi means "Jump of Ka Likai." The story is that a widowed women 'Ka Likai' remarried and her second husband was jealous of her daughter as she would spend most of her time looking after her girl. While, she was at work, he killed the daughter and prepared a meal from her flesh. Upon returning from work, Ka Likai who was hungry finished her meal. Only later, she found her daughter's severed fingers lying around and realized what happened. Unable to control her anger and grief, she plunged to death from the same cliff and the falls has been named after her. Right adjacent to the view point of Nokalikai Falls small shops set up by villagers sell organic local herbs, spices, pure mountain honey and something similar to a bark of tree. Looking at the sheer size of the bark, we could have never guessed that they were actually selling nothing but 'Dalchini' (Cinnamon.) This amazing spice with medicinal property was being sold at dirt cheap price. At the parking lot, we got a taste of organic fruits from one of the local stalls. 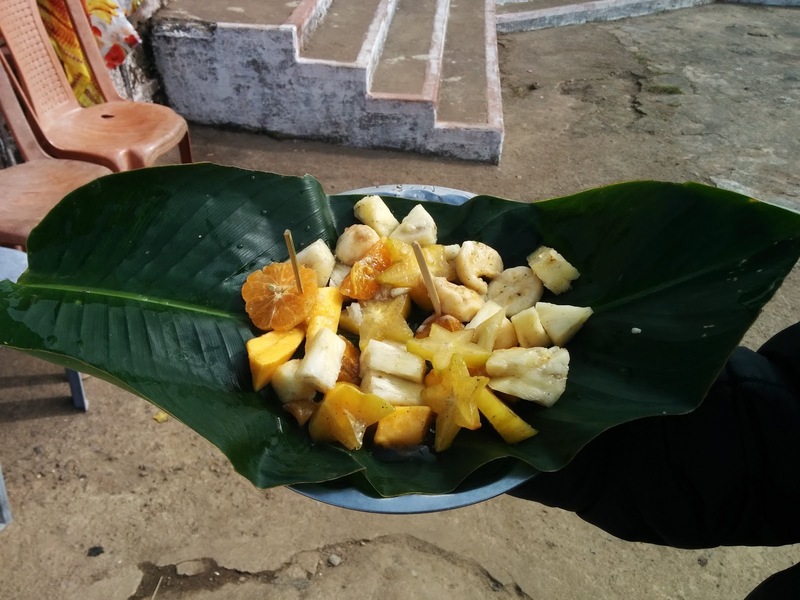 They were selling farm fresh fruits neatly cut and plated in leaves. For the very first time in our lives we tasted wild bananas that had seeds the size of pepper corn. It was an awesome experience to relish juicy fruits with the views of the amazing waterfalls. Meghalaya has plenty of caves to boast and many of them are totally unexplored and un-mapped. Some of these magnificent caves are believed to be the largest in Asia if not the whole World. Cave exploration is yet to take off here with just one initiative taken by the Government of Meghalaya. While most of the caves require proper cave exploration equipment and the guidance of an experienced explorer, Mawsmai cave gives commoners like us an awesome experience of wriggling around and exploring a well lit and traveller friendly cave, minimizing any risk. An entry fee of Rs.20 per head gave us access to this amazing limestone cave. We felt like we were teleported to another World. A relatively large entrance continued to steadily shrink and at one point we had to squeeze ourselves through certain parts. The stalactites were such amazing work of Nature that certain sections looked like sets of the movie Star wars. The total 150 meter experience unfolds very unique and amazing stalactites and stalagmites formations. Kindly do not wander off the designated trek path as the other larger sections of the caves are cordoned off and are not lit up. It is very easy to get lost and you can forget about any rescue or help arriving. The exit of the cave is very small and narrow. As we stepped out we were so overwhelmed by the fact that despite having trekked down the 150 meter it was quite unbelievable to imagine that a massive cave lay in front of us. The entire section was completely covered by wilderness. There are quite a few good restaurants around the caves and it would be the best place to break for lunch. During our visit to Meghalaya unfortunately the much hyped seven sister waterfalls or Nohsngithiang Waterfalls was dry. It is said that sighting a rainbow here is pretty common which makes this place even more scenic with the water cascading down the hills surrounded by lush greenery and the rainbow in the backdrop. This definitely calls for making another trip to Meghalaya to experience it at its best- during the monsoons. Apart from the two massive well known falls another falls en route Cherrapunji is the 'Wah Kaba Falls.' A ten minute hike from the main road took us to a view point from where we could see her in full flow. Another interesting stop over en route is Ramakrishna mission. The place, the person who set it up and his mentor needs no introduction. Their Legacy lives on! "Awake, Arise and Stop Not Till The Goal Is Reached." 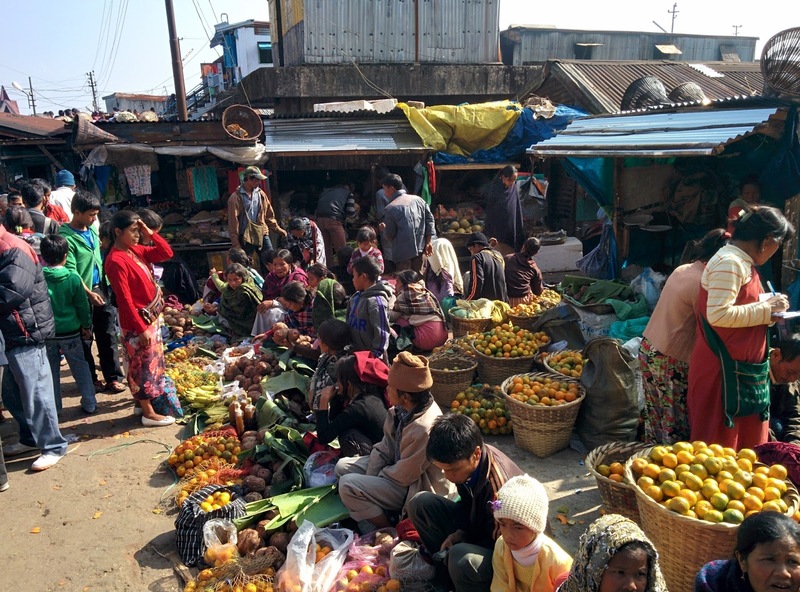 While you visit Cherrapunji, try and figure out if it is the weekly market day. A congregation of massive number of local farmers sell a wide range of products here and the best among them are super sweet oranges. It is a must try as this part of the country is very famous for the yummy oranges and is named after it too. Another product in the market drew our attention- we were baffled to see locals selling a very different looking leaf that was pretty large in size. In a matter of few seconds our curiosity was put to rest. 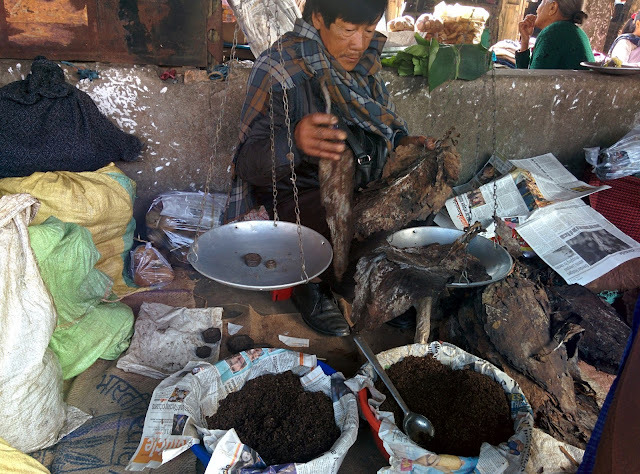 They were nothing but tobacco leaves and a couple of seconds more, we could feel the strong scent of tobacco. It would be perfect to visit all the places of interest and then head to Tyrna village, the basecamp for the Double decker Living Root Bridge and retire for the day. Early morning next day, would be perfect for the hike to the Root Bridge. Your 50 day trip sounds epic! Will you be posting the entire trip account? Hey Preeti, thanks and yeah we have updated all posts and this was the last one. You can now read all of them covering Nagaland, Manipur and Meghalaya. First post "experiencing beauty of North East India." Thanks Vivek, glad you liked the post. Hi Rajaram!! Thanks for such kind words, glad you liked our post :) We were there in December 2015. While seven sisters waterfall was absolutely dry, the other waterfalls had good amount of water.